Source: I purchased an e-copy for my own reading pleasure. Source: I received a copy via NetGalley from the publisher for review. In a market flooded by urban fantasy and paranormal novels, they can all start to sound similar after awhile. I admire the author who takes a chance and tries to create her own world among the existing ones. Jamie Quaid certainly adds her own spin to the genre with the Zone, a hodge podge of toxic waste and magical happenings. Justine "Tina" Clancy doesn't know much about the Zone, only that it is the only place she could get a job. She has to pay her way through law school somehow, and although she's not sure how she'll become a licensed lawyer given her arrest record, she's hoping somehow she can get it expunged from her record. Tina is your average woman. There's nothing particularly remarkable about her. She has a limp caused during her arrest and takes great pains to fade into the background, not wanting to draw attention to herself. When her boyfriend doesn't pick her up like planned one day after work, her anger flares. When she does see him, coming right at her in her own car, she damns him to hell--not really anticipating that's where he would go. And suddenly Tina isn't so average anymore. Tina's strong sense of justice soon lands her in a heap of trouble. She isn't quite sure if her "gift" to met out justice is a byproduct of the Zone or if it is something else entirely. Could she really be one of Saturn's Daughter's? On top of this new found "gift" of hers, she starts suspecting that the car crash was more than what it seemed. Did someone cut Max's brakes? And if so, who? The more questions Tina asks, the more trouble seems to come her way. Always one to go it on her own, Tina realizes she may be in over her head, and finds she has more friends than she realized. The cast of characters in Quaid's novel are eccentric to say the least. There is an invisible thief, a kitten that is more than he seems, a shape shifting woman that has more in common with Tina than she at first realizes, and that hunky but shady boss of hers. 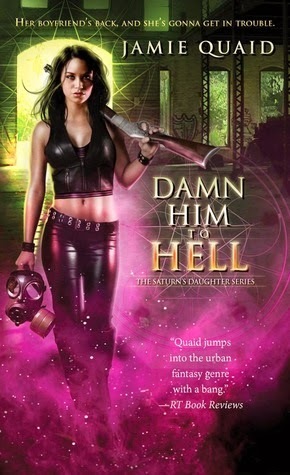 Boyfriend From Hell was a fun romp in an urban fantasy world. I never quite got a handle on the Zone, its purpose and definition kind of blurry, even for Tina, who is just beginning to realize there is more than meets the eye. I imagine it will become clearer as the series progresses. There was quite a bit going on in the novel, but somehow I managed to keep everyone and everything straight. I came to really like Tina; although I kind of wish her "rewards" would have taken on a different slant. Instead of great hair and perfect legs . . . I liked the idea of a physically flawed heroine. But it is a fantasy world, after all. The novel was a good start to a new series, and a great escape. I read the second book in the series pretty close on the heels of the first book. Damn Him to Hell was even better than the first book--and it was good to see so many familiar names and faces. In the second book, Tina has graduated from law school and is ready to begin practicing law. She has an internship with a Baltimore attorney, one she's bringing coffee more than she's actually putting her legal skills to use. An explosion at the local chemical plant in the Zone leaves behind quite a few comatose patients, many of whom are being picked up by people in white vans hoping to cover their tracks. Tina and friends act quickly to try to save some of the victims on their own, unsure about what is happening. She is determined to find out though, even if it means putting herself in mortal danger as a result. The Zone becomes a little less hazy in this second book, although it is still an enigma. Is it somehow a safe haven of sorts for the city's supernatural? Is it really a toxic dump? What exactly is happening in the Zone? I have more questions than answers after reading this book, but I am definitely intrigued! I find this series quirky and fun. I like that Tina isn't afraid to ask for help when she needs it nor is she afraid to take a risk. She stops and thinks before she acts, and even though sometimes she still goes with her first impulse, I generally agree with the outcome. Both of these books are full of action, making for fast paced reading. There's a hint of romance, but it's really more tease than anything hot and heavy. Although both books could probably stand along just fine on their own, I would recommend reading them in order just so you don't miss any of the back story. You can learn more about Jamie Quaid, aka Patricia Rice, and her books on the author's website. I absolutely couldn't resist those covers!! this series does sound pretty cool. I do understand about getting lost in the world that the author created and trying to figure it all out! It sounds a lot of fun I have to say, and I like the flawed heroine, too (though for that if perfection is her reward that doesn't sound so good). I'd give them a go and like Staci think the covers are great. Charlie - It's a fun series so far. I am really curious to see what direction the author goes with the series. It sounds like she could keep with the same main character or go off to other characters like Kelley Armstrong in her Women of the Otherworld series. I do tend to lump all of these similar series together. Maybe it's because the cover are so alike? I could also say the same thing about romances! Stacy - It's easy to do, especially if you read too many back to back. And you're right about romances too! I need to get started and read these already!!! They sound good and I've wanted to read them every since I heard you talking about them :) Great reviews! Samantha - I hope you'll let me know what you think when you read them!